Ruiva (left) and Lúcia, the protagonists of the film Salve Geral, photo by Salve Geral Press Office. 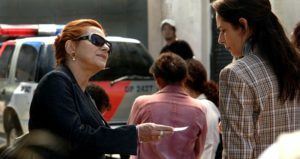 RIO DE JANEIRO – The Brazilian Ministry of Culture announced its candidate to represent Brazil in the 2010 Academy Awards last Friday. The film is ‘Salve Geral’ (General Rescue) and it beat off competition from nine other contenders to enter the running for the Oscar for the Best Foreign Language Film. The film is based on the real events of Mother’s Day, May 12 2006, when the Primeiro Comando do Capital, or PCC (First Command of the Capital) brought São Paulo to a standstill, killing hundreds of police and civilians. The PCC is a criminal organization in Brazil that was supposedly created to defend the rights of incarcerated citizens, but has in atuality been the force behind many illegal acts in São Paulo. On this day the police began an operation to transfer 756 dangerous criminals to high-security prisons in the state. Communicating by cell phones with the PCC on the outside, the prisoners rebeled and subsequently murdered police officers and security officers. A “festa” (party) of horror in every neighborhood then ensued in a PCC operation named ‘Salve’ (Save). Police stations, gas stations, banks, car showrooms, shopping centers, the subway and airports were held up, while dozens of buses were set on fire. Cities in Greater São Paulo such as Osasco and Cubatão were also subjected to acts of violence. The film’s protagonist is Lúcia, a widowed piano teacher experiencing financial difficulties. Her son, Rafael, aged eighteen, has been imprisoned for his involvement in an incident which led to the death of another youth, and Lúcia’s goal is to get him out of jail. During her visiting hours at the prison, Lúcia gets to know Ruiva, a PCC leader, and for financial rewards, accepts Ruiva’s requests to participate in the PCC’s missions. 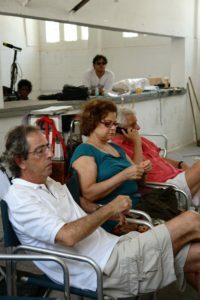 The director of ‘Salve Geral’ is Sérgio Rezende, famous for films such as ‘Guerra de Canudos’ (War of the Canudos), ‘Zuzu Angel’ (Zuzu Angel), ‘Mauá, o Imperador e o Rei’ (Mauá, the Emperor and the King) and ‘O Homem da Capa Preta’ (The Man with the Black Cloak). The director on set, photo by Salve Geral Press Office. ‘Salve Geral’ goes on general release in Brazil on October 2. Some critics have lamented the Ministry of Culture’s choice because of the focus on violence and lawlessness, also a dominant theme in last year’s candidate ‘Ultima Parada 174’ (Last Stop, 174) and the globally-successful ‘Cidade de Deus’ (City of God). One of the members of the Ministry of Culture’s selection jury, Carlos Gerbase, has explained that ‘Salve Geral’ was chosen for “its artistic and technical qualities, and for maintaining a dialogue with important questions for the country, such as violence”. The next stage of the process lies with the Academy, as a special commision will watch films submitted from across the globe to short-list the five nominees for next year’s Oscars ceremony. To date, apart from Brazil, only Hong Kong, Japan, Taiwan and Kazakhstan have already chosen their candidates. More than forty countries will join them in the next few weeks. To watch the trailer of ‘Salve Geral’, go to the film’s official website.